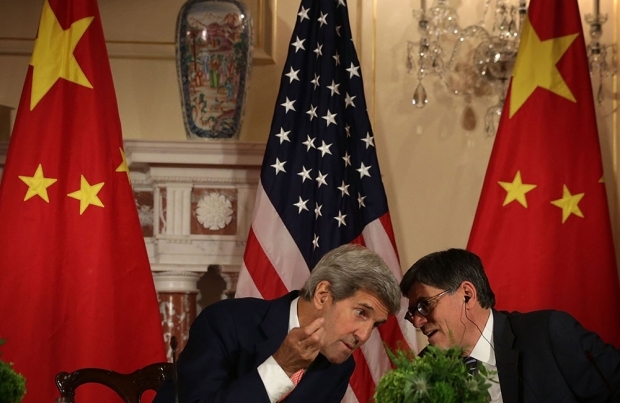 U.S. Secretary of State John Kerry and U.S. Secretary of the Treasury Jacob Lew participate in closing statements at the U.S.-China Strategic and Economic Dialogue in Washington, D.C. last June. China is asking the U.S. to help apprehend high-level officials targeted in its anti-corruption campaign. I am a great believer in Sino-American cooperation. Like many Americans I support Xi Jinping’s remarkable campaign against corruption. I would be happy to rid the United States of genuinely corrupt fugitives from any country, including China. Yet, unless China experiences another Cultural Revolution or a slaughter of its youth similar to that of June 4, 1989, I cannot imagine a worse time for the two countries to negotiate an extradition treaty. There is a reason why the U.S. and most democratic nations do not have extradition treaties with China. That reason is China’s criminal justice system, which, twenty-six years after the Tiananmen tragedy, has still failed to meet the minimum standards of international due process of law. Indeed, since Xi Jinping’s assumption of power, despite a plethora of hymns extolling the rule of law, in practice China’s criminal justice system has been steadily marching in the wrong direction, and this is no state secret or development known only to Chinese and foreign legal specialists. The whole world knows of the Communist Party’s ongoing brutal attack upon China’s human rights and criminal defense lawyers. Until recently, although hundreds of hapless defendants were convicted in unfair proceedings each year, I took hope that legislative improvements, such as the rule calling for the exclusion of coerced confessions from criminal evidence, would soon be reflected in practice. Unfortunately, five years later, that rule has not yet become “living law.” Most Chinese law reformers have long had to content themselves with better statutes, being unable to afford the luxury of worrying about the failure to implement them. Now, however, we have to recognize that, instead of practice gradually coming to conform to legislation, legislation is being revised to conform to practice. The National People’s Congress is enacting a comprehensive legislative agenda designed to confirm China as a de facto garrison state administered by the police and other domestic security forces. Hence the new National Security Law, the draft Cybersecurity Law, the draft Counter-Terrorism Law and the draft Foreign NGO Management Law designed to terminate exchanges with Western organizations that preach such “hostile” concepts as constitutionalism, independent judges and unfettered defense counsel. As part of this legislative assault, the Criminal Law itself is about to be amended so that any lawyer bold enough to wage a vigorous defense in court can easily be sentenced to three years in prison, marking the end of his career. Moreover, any lawyer who reveals to anyone—even to a witness, a colleague or a defendant’s family—anything about a trial declared to be “secret,” as major corruption trials often are, will be subject to similar punishment. And, to further restrict the scope of defense counsel, the Ministry of Justice has been presiding over the revision of legal ethics norms regulating lawyers’ conduct in and out of court. We also must acknowledge that, however disappointing and dangerous this new round of legislation may be, in China today laws nevertheless continue to be secondary to lawlessness, as the current attack on lawyers demonstrates. To be sure, in individual cases Chinese defense lawyers have frequently been subject to kidnapping, torture, illegal detention, arrest and prosecution, loss of employment, disbarment and many other forms of intimidation, not only against themselves but also their families. But what is distinctive in recent weeks is the uninhibited attack, at the same time in many Chinese cities, upon hundreds of rights lawyers and their staff, whether or not they are at present involved in controversial cases. This is an effort to destroy any remaining possibility of waging a vigorous defense at trial or of challenging government in the broader arena of public opinion. In these circumstances, how can any democratic government negotiate an extradition treaty with China? The most that the U.S. government can do is to look carefully into each case presented by the PRC, see whether the suspect appears to have violated American immigration, financial or other laws and then open discussion with the suspect and his counsel as well as with Chinese officials to seek a solution to the specific case. Such informal discussions are necessarily non-transparent, murky and complex, as were the cases of three Bank of China employees who over a decade ago were accused of absconding to the U.S. with almost five hundred million U.S. dollars. They were confronted with a choice of accepting pre-determined PRC prison sentences, excluding the death penalty, if they returned to China or remaining in the U.S. to face prosecution and undoubtedly longer prison sentences for violations of our federal law. Other factors had to be taken into account also, including any provision for return of the misappropriated funds, punishment for their spouses’ involvement and arrangements for their families. Faced with the double pressures of plea bargaining with American prosecutors and their Chinese counterparts, one chose immediate return and a 12-year sentence in Chinese prison, while the other two decided to stay in the U.S., reject guilty pleas and take a chance with a jury trial that they lost, resulting in sentences of over 20 years and the likelihood of subsequent deportation. Criminal prosecution in America and “voluntary” return to Chinese prosecution under threat of American prosecution—both rare to date—are not the only existing alternatives to extradition of alleged corrupt fugitives. The major option at present is the exclusion or deportation of suspects whose attempted entry into this country is found to have violated our immigration laws. But, like extradition, such measures surely raise human rights issues that may prevent repatriation to a country that is notorious for practicing torture on criminal suspects, denying them a fair trial and using corruption prosecutions as a vehicle for settling political struggles. Many more fugitives may spend time in U.S. immigration detention than in formal American prisons. The PRC, in March of this year, unveiled “Operation Skynet” as the successor to “Operation Foxhunt,” increasing its demands upon the U.S., Canada and Australia—the most popular destinations for fugitives—to repatriate a long list of Beijing’s most wanted suspects. The U.S. Government, to the extent we are permitted to know, seems to be trying hard to be responsive within the bounds of our very different legal system. Regular discussions have been held over the years in the China-US Joint Liaison Group on Law Enforcement Cooperation. In March an agreement was reached between the U.S. Department of Homeland Security and the PRC’s Ministry of Public Security, but, although a summary of its contents has been made available, perusal of its actual text may require a Freedom of Information Act lawsuit. China’s Ministry of Public Security claims that U.S. authorities are “prejudiced” against the PRC legal system and “mistakenly believe we would undertake unfair prosecution of suspects.” Our State Department has made clear that the U.S. will not force any foreign national to return to a country where no fair trial is available. High officials of the two sides will meet again this month to review progress in identifying what the State Department has called “a finite number” of alleged fugitives and in developing a strategy for addressing each of them, including the return of their stolen assets. The U.S. does not want to become more of a haven than it already is for foreign criminal suspects, but it also does not want to commit any further human rights violations. It is time for the PRC to fundamentally overhaul its criminal justice system to meet the standards of the International Covenant on Civil and Political Rights, which it signed in 1998 but has never ratified, and the other international human rights commitments that it has already made, like the Convention Against Torture. In light of the current campaign to tame human rights and criminal defense lawyers, however, prospects for a genuine rule of law look bleak. I don’t know any details about the Ling Wancheng case. But, in general, the U.S. government should take more active measures to support China’s anti-corruption campaign by extraditing corrupt officials and businesspeople hiding in the U.S. In fact, the two governments already have cooperated in this regard through the China-U.S. Joint Liaison Group on Law Enforcement Cooperation and the APEC Network of Anti-Corruption Authorities and Law Enforcement Agencies (ACT-NET). During his visit to Beijing in April, U.S. Homeland Security Secretary Jeh Johnson and his Chinese counterparts reaffirmed their commitment to work closely on the issue and “acknowledged that neither their country should serve as a safe haven for fugitives, and that each intends to endeavor to effectuate removals of such individuals within the bounds of their respective laws,” according to a DHS report. Such an unambiguous signal is very important so that most Chinese don’t see the U.S. as on the wrong side of the issue, thereby hurting the U.S. reputation the next time it tries to claim the moral high ground on fighting corruption. Corruption has long been a top public concern in China. Previous government campaigns often were short-lived or rhetorical in nature. But under President Xi Jinping, there is renewed hope among the public that this leadership is much more determined to tackle the difficult issue. No one should think that there is an easy fix for the deep-rooted and widespread official and business corruption in Chinese society (just look at how hard it is to battle money in politics in the United States). And some have doubts that such a campaign will be handled according to the law instead of political motivations. The good sign is that President Xi has made rule of law a key task of his administration and vowed to “put power in a cage”. There are already some positive signs in reforming the judicial system. Xi will have to move in that direction in order to make rule of law one of his key legacies. And that won’t be possible if it is just politically motivated as some worry. Like fighting corruption, building rule of law will be a long-term endeavor, and no one should assume everything can change overnight. It won’t. The major hurdle for returning these corrupt officials and businesspeople is the lack of an extradition treaty between the two countries. And it doesn’t seem possible to conclude such a treaty any time soon given some major differences in their judicial systems. However, it would still be good if the two governments start to discuss such a treaty no matter how remote it might appear. This is an area where good cooperation between the two countries could have a positive impact on the overall relationship. Most Chinese are likely to have a much more positive view of the U.S. when it returns those corrupt officials and businesspeople to face justice in China. And it also would set a good example for Australia and Canada, two other nations that have been labeled “safe haven” for corrupt Chinese officials and businesspeople. The presence of Mr. Ling Wancheng in the United States presents yet another short-term inconvenience to the handling of Sino-American relations. My basic inclination is the Obama Administration should make a very public and transparent case about its decision on Mr. Ling. That Mr. Ling’s being in the U.S. is not just a case of another average Chinese businessman who has chosen to immigrate is beyond doubt. Had his elder brother not fallen from power and grace in the Chinese governing system, Mr. Ling would most likely be moving freely in and out of China. In addition, Mr. Ling’s choice of America as his place of refuge, however temporary, is also beyond doubt carefully calibrated. Everything else being equal, Washington is one of the few capitals in the whole world that can afford to just say “no” to Beijing over such matters. Indeed, over the past decades, not a few Chinese individuals who have left China under similar circumstances have chosen the U.S. as their country of residence because they expect the United States government to be on their side, so to speak, when the government of China seeks them out. True, American society wanted no part of this in the first place. Yet, the United States happens to be known as one of most popular destinations for Chinese individuals in positions of power and influence, who suddenly decide to escape their home country. The Obama Administration has the option of taking a page from the Canadian government’s dealing with Lai Changxing, who for over a decade successfully hired one Canadian law firm after another in fighting against his extradition back to China, until he eventually lost in 2011. Like Mr. Lai, Mr. Ling almost certainly has the means to pursue a lawful stay in America. The downside of this approach is that it would seriously erode goodwill toward the U.S. on the part of average Chinese individuals, as there can hardly be sympathy for individuals like Mr. Ling. To put it bluntly, Mr. Ling is not another Mr. Chen Guangcheng. The second option is for the Obama Administration to tie proactive consideration of China’s request for extradition with progress on Chinese law enforcement authorities’ cooperating with their American counterparts in the latter’s desire to deport illegal Chinese immigrants. The plus side in doing so is that it may help earn some political sympathy from quarters in the U.S. society. Still, within China, a question could arise whether or not the United States has no other choice. Should Washington want to keep Mr. Ling in the U.S., however it would be terrible miscalculation. Beijing would of course then have less of an incentive to be forthcoming in entertaining Washington’s requests for collaboration. So, the stalemate is such that for Beijing and Washington neither side has much leverage over the other. It would benefit the U.S. and those of us who want bilateral ties to proceed along a more predictable path for Washington to make a public and transparent explanation about its eventual decision on Mr. Ling. Should the United States send Ling Wancheng back to China? Could it? I think it might be useful to lay out some of the legal issues involved here. First of all, let’s distinguish between extradition and deportation. Extradition would take place pursuant to a treaty between China and the US, and critically would not require a finding by U.S. authorities that Ling had violated any U.S. law (or even Chinese law). Nor would any other legal basis for sending Ling back (aside from the treaty) be required. All that is necessary would be for China to make a case—presumably meeting some standard of plausibility—that Ling had violated Chinese law and should be returned to face trial. But for the very cogent reasons discussed by Jerome Cohen in his contribution, there is no extradition treaty between China and the U.S. Thus, if the U.S. government wants to keep Ling, it has no obligation to send him back. This raises two issues: (1) Should it want to send Ling back? (2) Assuming it wants to send him back, can it? On the first issue, one of the points raised in this discussion has been the idea that sending Ling back will promote cooperation by China in U.S. law enforcement. I’m dubious about this. In a wide range of fields, China has over the years been consistently and highly uncooperative with both the U.S. and other countries in their efforts to investigate unlawful activities in China. The Securities and Exchange Commission and the Public Company Accounting Oversight Board have experienced years of frustration in seeking Chinese cooperation in their efforts to investigate securities fraud and accounting malpractices involving Chinese firms and citizens. Just two months ago, an Associated Press report described the “legal firewall” shielding Chinese parties from foreign investigations, in this case Italian attempts—utterly stonewalled by China—to investigate the flow of $4.9 billion in laundered money to China. And despite its denunciations of hacking and denials of government involvement, the Chinese government has refused to help foreign authorities bring Chinese hackers to book. China doesn’t need to do more than anyone else, but it does need to offer the degree of cooperation that’s normal in the international community before it can reasonably ask others to cooperate with it. If the US government has good policy reasons for wanting to send Ling back, so be it, but a vain hope that it will induce greater cooperation by China in a range of law enforcement activities should not be among them. The second issue is whether the U.S. government can send Ling back, assuming it wants to. The point, then, is that the U.S. government operates under some constraints where deportation is involved. It cannot just decide to deport and then deport. There must be a statutory basis. Let us suppose, then, that the U.S. government relies on deportability on foreign policy grounds—the first basis above, which does not depend on any violation of U.S. law by Ling. That is still not the end of the story. There is a further complication posed by the fact that Ling could raise various bars against deportation. He could, for example, claim that he is the subject of political persecution and seek asylum on those grounds. Such a claim would not, of course, necessarily succeed. The status of the CAT under U.S. law is complicated, but the long and the short of it is that Ling can raise a claim of possible torture to try to avoid getting sent back to China. (As with all claims, to say he can raise it is not to say he can raise it successfully.) Even assuming he could successfully make his case, however, there is still a final question: does the Secretary of State’s power to deport under 8 USC § 1227 trump an alien’s right not to be deported under the relevant Department of Homeland Security regulations implementing the CAT? Who wins in case of a conflict? The same conflict could crop up if Ling seeks asylum on the grounds of political persecution. I do not know the answer under U.S. law, but it might well be different from the answer under international law. At first glance, these 17th century formulae might not seem especially relevant to the ultra-modern issues troubling today’s fraught U.S.-China relations but, in fact, they deserve careful consideration. After all, Grotius wrote at a time when many in the great powers of Europe were seeking a way to stem the tides of escalating imperial and religious conflict, and establish a modus vivendi among mutually suspicious princes. That Grotius and his fellow legal scholars in significant part succeeded—setting rules of engagement that helped prevent great continental wars until the age of Napoleon—was in part due to the cautious realism underlying their efforts. During this foundational period, the law of nations was seen above all as a forum for states with equal status to reach settlements and avert conflicts, without sacrificing their plenary, exclusive sovereign powers by undertaking absolute obligations. Governments found customary means of handling many common disputes (including turning over fugitives), rather than be thrust into escalating hostilities. Today, of course, the question of extradition has become more complex than it was in Grotius’s day. Chiefly, it has been bound up with two issues not strictly related to the legal rights and obligations between sovereigns in the community of nations. These new developments are the human rights and constitutional protections of modern liberal democratic polities (where individual rights, such as the right to seek asylum to prevent likely torture, can prevent particular government actions) and the intensified flows of people and capital across borders in the conditions of 21st century globalization, along with their attendant political considerations. I think that these modern complications have been ably explored above. Human rights and other legal protections can impede extradition from the U.S. or other countries, for example as the result of applying the principles of the Convention Against Torture and its domestic enabling instruments in U.S. law. At the same time, however, the sheer scale of China’s corruption problem and the amount of assets that have already fled the country (sinking into American McMansions and elsewhere) mean that dealing with overseas fugitives requires systemic, not occasional, responses. Treating Ling Wancheng’s U.S. residency as a political or intelligence windfall rather than as a legal problem, will in the long run only exacerbate U.S.-China tensions. At the very least, policy-makers should be clear on the goal of relegating such cases as Ling’s to the status of mere incidents in a larger pattern, to which a legal solution can be found. The United States still lacks an extradition treaty with China, but like other countries it is faced with an increasing demand for a coherent policy on renditions. Australia, for example, agreed a treaty with the P.R.C. in 2007, but the lack of subsequent ratification (largely due to concerns over due process of law) left that instrument ineffectual. Now, though, there are compelling reasons for the U.S., Australia, Canada, and other de facto refuges for Chinese corruption revenues to contemplate treaties that could smooth diplomatic relations, improve global anti-corruption efforts, and help avert international tensions. It’s not unthinkable that targeted, well-designed instruments might build more space for legal and administrative collaboration without sacrificing human rights commitments. Grotius’s aut dedere aut punire (alternatively aut dedere aut judicare: either extradite or prosecute) remains an important principle of international law; indeed it is incorporated into the 2003 United Nations Convention against Corruption (to which both the U.S. and China are states parties). Arguably, all members of this convention are obliged to attempt to find legally feasible ways to facilitate the investigation and prosecution of corrupt officials, as some Chinese scholars and prosecutors have argued over the course of the present campaign. The U.S. should seek to balance this commitment with its own more robust due process protections by proposing a treaty under which a preliminary legal review of a suspect’s culpability is undertaken by an independent domestic tribunal in a fair and transparent process. In accordance with the resulting judgment, and with the less-remembered Grotian principle of extraditing only such suspects as have been “verified as guilty”, the proper thing to do with such corrupt officials is then to ensure that they face justice, not offer them protection or any opportunity for political deal-making. Concerns over subsequent treatment (such as those noted earlier in this Conversation) would be correspondingly reduced by existing findings of guilt at a high evidentiary standard (there would be little need left for extracting confessions). Though existing extradition treaties, such as the one between the U.S. and Hong Kong, already require the ability to demonstrate a prima facie case against the suspect and a lack of political motivation for prosecution, additional procedural steps involving more detailed hearings and fact-finding should also be developed. If American policy-makers were to go this route, such dramatic developments as Ling Wancheng’s great escape to California might seem less exciting, and indeed less like potential political or intelligence bonanzas. Yet this is no more than the price to be paid for increasingly ‘enlightened’ international legal mechanisms. With any luck, future fugitive cases such as Ling’s will come to seem less like the suspenseful defection incidents of the Cold War era and more like rule-bound matters to be discussed in the staid (even Latinate) legal idiom of a stable international system.